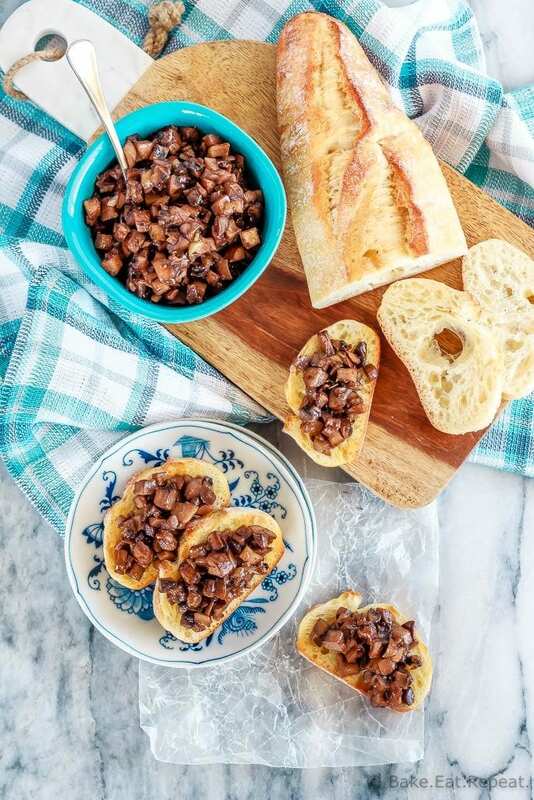 This maple mushroom crostini is the perfect appetizer or snack! 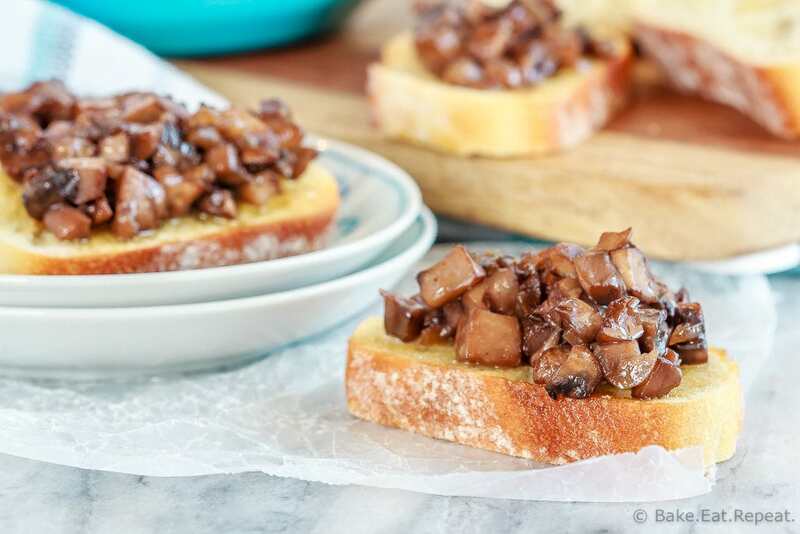 Sauteed mushrooms caramelized with maple syrup and served on toasted baguette – so good! Oh my goodness – you guys, you need to make this maple mushroom crostini! If you like mushrooms. If you don’t, you won’t like it at all. Although you never know – mushrooms are awesome and this may just change your mind if you think you don’t like them. It’s that good. Chopped cremini mushrooms (the brown button mushrooms, although white button mushrooms would work just as well here) are sautéed with some onion and garlic until they’re softened, then caramelized with maple syrup, red wine and a bit of soy sauce. Serve them on top of toasted, thinly sliced baguette for the most amazing appetizer. We also enjoyed some of the tasty maple mushrooms with a slice of soft havarti cheese on top of the baguette – when you add the hot mushrooms it melts into the bread and is completely divine. Although we couldn’t actually decide which way we liked it better, with or without cheese – I think you really need to make both! I meant to take some photos with the cheese too, but, um….we ate it all. In fact, we ate entirely too much of this maple mushroom crostini because it was so good and we could not make ourselves stop. It was basically supper that night instead of the appetizer it’s meant to be. Clearly we can’t be trusted to have this stuff around unless we have a houseful of people! So….who wants to come over so I can make some more? if you prefer not to use alcohol in your cooking you can replace the red wine with beef stock – the flavour will be a bit different but it will still be fantastic! the maple mushrooms are terrific on plain toasted and buttered baguette slices, but are also amazing with a slice of creamy havarti too – so try both! here are a few more amazing mushroom appetizers to try: Cheesy Taco Stuffed Mushrooms, Beef Spinach and Mushroom Strudel, or Bacon Wrapped Crab Stuffed Mushrooms. 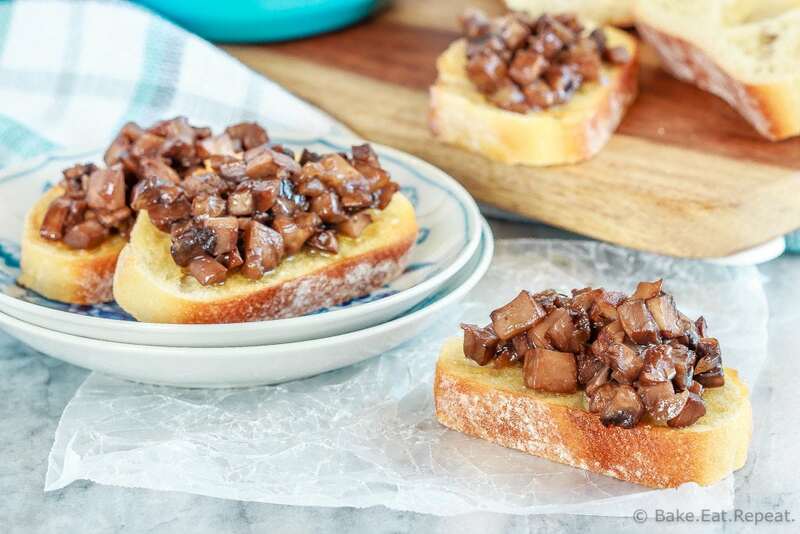 This maple mushroom crostini is the perfect appetizer or snack! 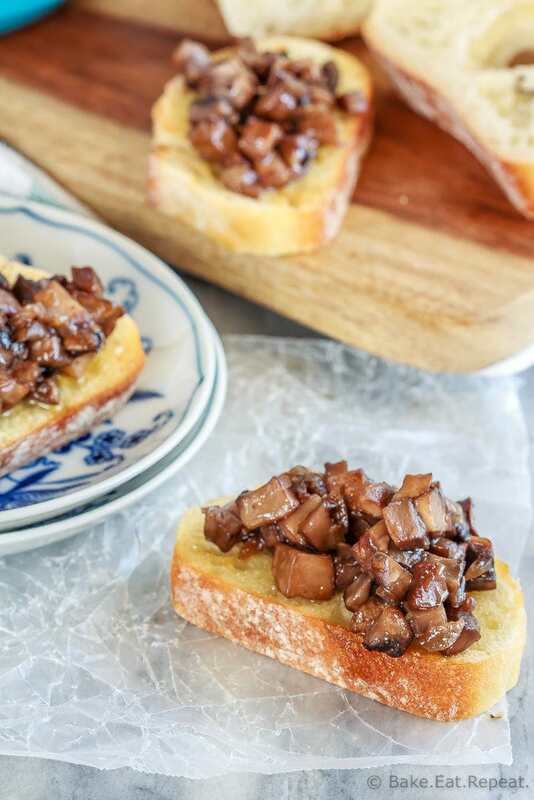 Sauteed mushrooms caramelized with maple syrup and served on toasted baguette - so good! Heat the oil and butter in a large skillet, over medium heat, until the butter is melted. Add the mushrooms and onions and cook, stirring, for 3-4 minutes or until they are softened. Add the garlic and continue to cook, stirring constantly for another 2-3 minutes, or until the mushrooms have released their liquid. Add the maple syrup, red wine and soy sauce and continue to cook, stirring occasionally until the mushrooms begin to caramelize and the liquid has been cooked off. Serve the hot mushrooms on thin, toasted and buttered slices of baguette, with a slice of havarti cheese or with some cream cheese under the mushrooms if you like. We enjoyed it both with and without the cheese. Any leftover mushrooms will reheat nicely the next day either in the microwave on low or on the stovetop. Source: Adapted from Crown Maple .